Our family loves to travel and we are busy planning a trip to Universal Studios Florida. It will be our first time going there are a family and the kids cannot wait! Planning a family vacation to an enormous theme park for the first time can get overwhelming. There is a ton of information online, but it’s hard to know which advice to follow until you’ve been there yourself. One of our favorite ways to get background on a new place before we have the chance to visit is to head to YouTube and check out the videos. It’s a great way to “see” what the different rides and parks are like. Here are some of our favorite videos you can use to help plan your family’s trip to Universal Studios Florida! We are attending Family Forward, a 4 day family retreat for social media influencers and their families, organized by Mom It Forward and will be staying at the Loews Portofino Bay Hotel. My kids think that the hotel is just as much fun as any of the places we will visit and wanted to know what it looked like immediately. There are tons of gorgeous photos on their site but it is this video of the Despicable Me Kids’ Suites that they want to watch over and over again! Harry Potter and the Escape from Gringotts in the new Diagon Alley is the ride of the summer! It’s an action packed, 3D ride that even non-Harry Potter lovers have fallen in love with. We are excited that even our preschooler has reached the required 42 inches we can all ride when we go! To day we are excited to see the minions is an understatement–we are totally minion-obsessed! On the Minion Mayhem ride you get to go through “Minion Training” and become a minion, but of course things quickly go awry. 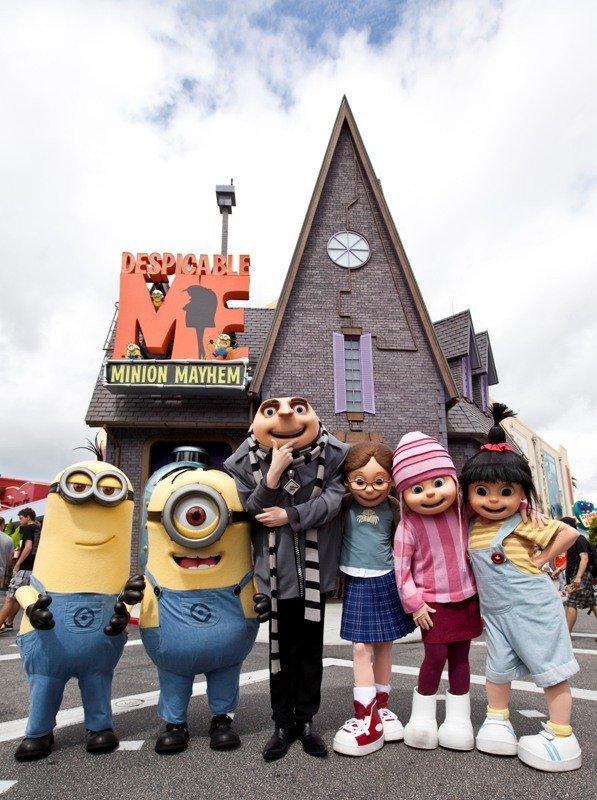 This 3D ride takes you through Gru’s super-villain laboratory and ends in a minion-inspired dance party. We can’t wait! My kids are huge super hero fans so I cannot wait to see their faces when we ride The Amazing Adventures of Spiderman! It’s another 3D ride where you get to soar with Spidey through the streets of New York City fighting off bad guys and saving the day! My husband grew up playing with Transformers and is super excited to try the 3D ride! We are ready to join forces with Optimus Prime and Bumblebee to defeat the Decepticons. And that’s not all! There are so many more exciting rides and attractions at Universal Studios Florida. Jurassic Park River Adventure, The Cat in the Hat, E.T. Adventure and MEN IN BLACK Alien Attack are also on our must-do list! For even more videos and planning ideas we like the vacation planning videos on the Universal Orlando Resort site too!